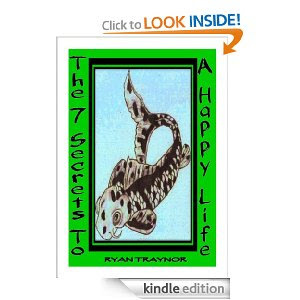 Ryan, my incredible fiance', wrote another Kindle book a couple of weeks ago. I should have made this post then, but I've been busy. It is called, "The 7 Secrets to a Happy Life" and well, that's basically what it's all about. He says that he is at the happiest point in his life and wanted to share what he has done to get there. I read it and I really enjoyed it. It's a sweet and helpful book for others looking for ways to find happiness in their own lives. The search for happiness can be elusive and mysterious. It can take you all over the world and into the farthest reaches of your consciousness. This exploration can teach you difficult lessons and uncover heights unimaginable. The possibilities are endless when you open your mind, body and soul. The seven secrets offer hope to anyone who wishes to see life from a whole different perspective. Come with me on a journey and we will discover the simple joys life has to offer. We will unearth the profound truth of what it means to be human. Additionally, we will expose the real purpose of existence as we read between the lines of everyday life and open our eyes to the world around us. Even though you may be caught in the grips of misfortune, you cannot give up. Fight your way through the harsh intricacies of this plane we call reality and keep your head up. In the end, you will come to realize that happiness is just a stone throws away. It is only $0.99! It can be downloaded onto any Kindle, or Kindle app on iPod Touch, iPhone or any smartphone, iPad, android devices, or directly to any computer through Kindle Cloud. All you need is a free amazon account and it will download to your device in a matter of seconds! I'm so proud of my future husband. I just love his writing style. He seems to have this really nice rhythmic flow with his words.